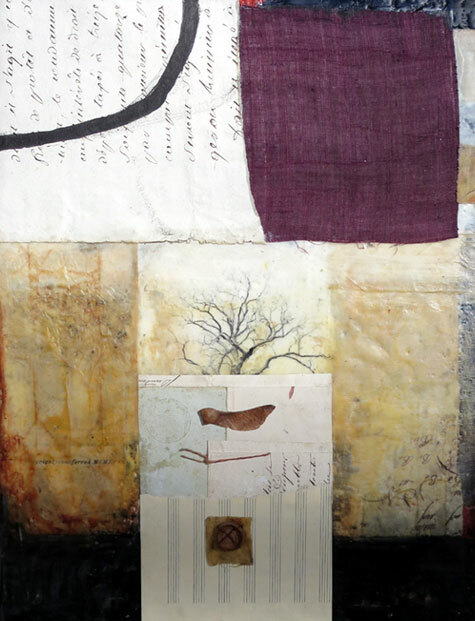 This encaustic and mixed media piece is currently at Lark and Key Gallery for their 10 Year Anniversary exhibit called Flight. Congratulations to the wonderful team at Lark and Key on their 10 year anniversary! I’m honored to be part of the gallery and wish them many more years. When I heard that the exhibit was called Flight, I knew I would be sending them some birds. But I also wanted to expand beyond that. I made a list with my daughter. We came up with bees, obviously since at that time I was working on my hive, a variety of insects, and then I thought of my favorite winged seed pods- samaras, aka helicopters. As a child, and even now, I love to stand underneath a maple tree on a windy day and be surrounded by the twirling winged seeds. My affections extend to acorn hats as well that fall from the oak trees. It really is such an amazing process when you stop to think about it- the long descent of the seeds and nuts from these towering giants overhead. And then the chances of that seed/nut finding just the right conditions to sprout and take root. And then the years that must pass for the seed/nut to turn into a sapling to turn into a tree and grow and grow and grow. Flight down to the ground and then growth back up to the sky. A beautiful and sacred journey. If you are in the Charlotte area, the opening reception for Flight is this Friday, February 2nd during the South End Gallery Crawl from 5-8pm.